Other Food: daily devos: Are you partial? How do you respond when someone who is an outcast claims you as a friend? Perhaps it's a person who has mental health issues, or is generally a social misfit and does things that are awkward and inappropriate. 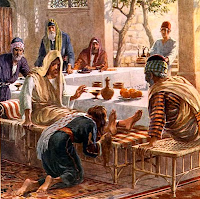 This is what happened to Jesus at the home of Simon, a Pharisee. A woman (which, in that society, was bad enough), who was a sinner (her specific sin isn't mentioned, but we can imagine), came into the room while they were eating and stood behind Jesus weeping. Then she washed His feet with her tears, wiped them with her hair and anointed (poured) oil on them from her flask of fragrance. Talk about an embarrassing, uncomfortable, squirmy situation for Jesus! At least the Pharisee thought so. He was mentally judging whether Jesus really was a prophet because He was allowing this to happen. Jesus grasped Simon's thoughts. He showed them to be shallow by explaining to him how the woman's actions were the most sincere and real expressions of love in the room. They went way beyond Simon's own dinner invitation and the hospitality he was showing. The woman did this extravagant thing, Jesus explained, because she was sorry for the many big sins she had committed. And then He forgave her those sins. We see Jesus had had this kind of interaction with women before. Among His most loyal disciples were a group of once unsavoury women, many of whom were still there after His death (Luke 8:2,3; 24:10). Jesus' way of responding to this woman's unusual but beautiful outpouring is a big rebuke to me. I must confess, I don't handle irregular people well. I, sadly, think way more about how others will perceive me if I'm friends with them than what God sees in their hearts. James speaks about people like me . He calls this kind of behavior "partiality" and names it "sin" (James 2:9). PRAYER: Dear God, please forgive my attitude of partiality. Help me to get past my fear of people and what they will say, to being more concerned with how You perceive others. Help me to extend Your love to all I meet today. Amen. I love the complete unselfconsciousness of this unnamed woman as she illustrates her love to Jesus and worships Him with the best she has. The song "Pour My Love On You" by Phillips, Craig and Dean translates that gesture into adoration we too can express. "Pour My Love On You" (Phillips, Craig and Dean).